A mother plays with her 1-year-old son at a day care center in Lynn, Massachusetts, March 2015. More mothers would increase their earnings and seek new job opportunities if they had greater access to reliable and affordable child care. In March 2019, a group of mothers working for Amazon—known as “Momazonians”—organized an information-gathering and advocacy campaign that urged the company to provide a backup child care benefit. The group of nearly 2,000 Amazon employees with young children argues that a lack of affordable child care has prevented talented women from progressing in their careers. These mothers are “tired of seeing colleagues quit because they can’t find childcare.”1 The Momazonians are calling on Amazon to subsidize a backup child care option for when their primary child care arrangement falls through, similar to the benefits offered by its peers such as Apple, Microsoft, and Google. This employee-led effort demonstrates the clear connection between access to affordable, quality child care and labor force participation—especially for mothers. However, employers cannot solve the nation’s child care crisis alone, and a few days of backup child care do not meet the needs of parents who must coordinate and pay for full-time year-round care. Child care challenges have become a barrier to work, especially for mothers, who disproportionately take on unpaid caregiving responsibilities when their family cannot find or afford child care.3 In a 2018 survey conducted by the Center for American Progress, mothers were 40 percent more likely than fathers to report that they had personally felt the negative impact of child care issues on their careers.4 Too often, mothers must make job decisions based on child care considerations rather than in the interest of their financial situation or career goals. This report highlights the relationship between child care and maternal employment and underscores how improving child care access has the potential to boost employment and earnings for working mothers. Based on new analysis of the 2016 Early Childhood Program Participation Survey (ECPP), it demonstrates how families are having difficulty finding child care under the current system and how lack of access to child care may be keeping mothers out of the workforce. 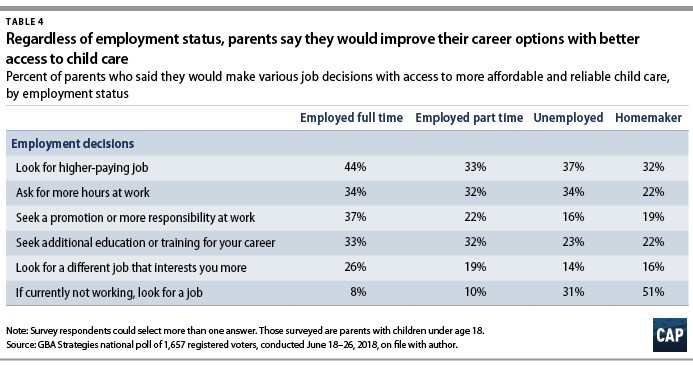 The report then presents results from a national poll conducted by the Center for American Progress and GBA Strategies, which asked parents what career decisions they would make if child care were more readily available and affordable. Finally, the report outlines federal policy solutions that are crucial to supporting mothers in the workforce. 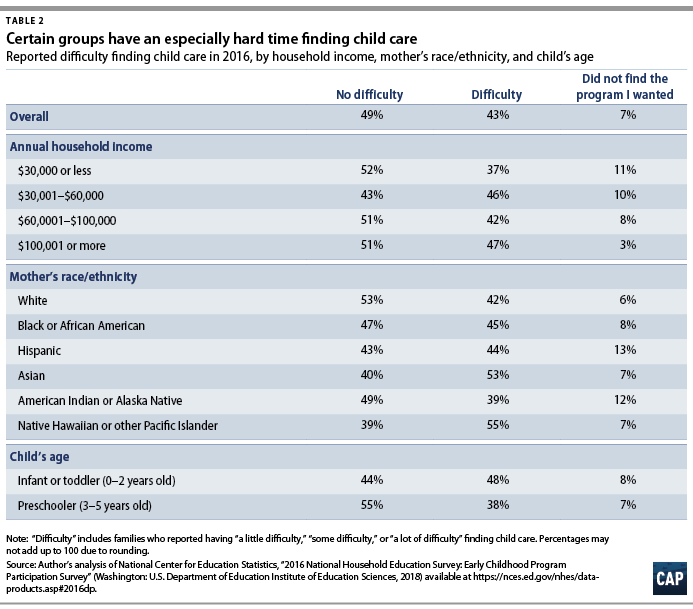 Half of U.S. families reported difficulty finding child care. Mothers who were unable to find a child care program were significantly less likely to be employed than those who found a child care program, whereas there was no impact on fathers’ employment. In the CAP survey, mothers said that if they had access to more affordable and reliable child care, they would increase their earnings and progress in their careers by finding a higher-paying job, applying for a promotion, seeking more hours at work, or finding a job in the first place. The current child care system in the United States is broken. The United States must prioritize the needs of millions of working families and take steps to keep mothers in the workforce through investing in policies to support access to affordable, quality child care. Child care is necessary for parents—particularly mothers—to work and earn an income, yet it has become an increasingly crushing expense for families with young children. Over the past two decades, the cost of child care has more than doubled,9 while wages have remained mostly stagnant.10 Many parents find that child care expenses consume most of their paycheck, and some decide to leave the workforce as a result.11 Typically, mothers are the ones who make that tradeoff. Expanding mothers’ access to child care and other workplace supports is vital, as American families are increasingly relying on mothers’ incomes. Almost 70 percent of mothers are in the labor force, and in 2015, about 42 percent of mothers were the sole or primary breadwinners in their homes.17 Black and Latina mothers work at even higher rates and are more likely to be the primary breadwinner in their households than white mothers, with 71 percent of black mothers and 41 percent of Latina mothers serving as the primary economic support for their families.18 At the same time, women are disproportionately working in low-wage jobs with nonstandard hours and inconsistent schedules.19 Many of these mothers struggle to find affordable child care that aligns with their work schedules and is available during evenings and weekends.20 Child care challenges, coupled with low-wages and irregular schedules, make it difficult for many mothers to stay in the workforce—whether full or part time. These programs have demonstrated benefits for promoting maternal labor force participation and positive child outcomes.23 Due to their targeted nature and chronic underfunding, however, only a small portion of families who need assistance paying for child care receive it. Certain families disproportionately face barriers to accessing child care. The 2016 ECPP survey shows that low- and middle-income families, families of color, and parents of infants and toddlers struggle to find child care, as well as report at high rates that they were unable to find their desired child care program. (see Table 2) Families also cite a variety of reasons for having trouble finding care that shed light on how the current child care system is failing to meet families’ diverse child care needs. Families earning less than $100,000 per year identified cost as the primary barrier to finding care, while families in the highest income quartile cited quality concerns and limited slots as the main reasons for difficulty. With the cost of child care amounting to thousands of dollars each year, low- and middle-income families are increasingly priced out of the child care market and struggle to find a program that they can afford. Lower-earning families were also more likely to cite location as a reason for difficulty, which is likely due to a lack of child care infrastructure in lower-income neighborhoods—and perhaps, barriers to accessing affordable and reliable transportation.33 Together, these factors can constrain child care choices for low- and middle-income families. Higher-income families cite lack of slots and quality as their primary challenges likely because there is greater competition for a limited number of slots in high-quality programs. More than half of families in the lowest income quartile said that they had no difficulty finding child care—a rate comparable to that of the highest-earning families. This could reflect access to means-tested programs such as Head Start, or the fact that lower-income families turn to relatives and friends for child care and therefore may not have to undergo an extensive search to find someone to care for their child. However, the lowest-earning families also reported that they were ultimately unable to find their desired child care program at about three times the rate of the highest-earning families. This could suggest that Head Start and child care subsidies serve some low-income families well, but that in the absence of that assistance, other families find themselves unable to find an affordable option that meets their needs. Families with infants and toddlers—children under age 3—are significantly more likely to encounter difficulties finding care than families with 4- and 5-year-olds. Fifty-six percent of families with infants and toddlers reported some degree of difficulty finding care, compared with 45 percent of preschool-aged children. Families with infants and toddlers also reported that “lack of available slots” was the primary reason for difficulty at higher rates than families of preschool-aged children. (see Figure 1) This is consistent with a recent CAP analysis that showed a severe undersupply of child care for infants and toddlers, with infants and toddlers outnumbering available child care slots by more than 5-to-1 overall, and by 9-to-1 in rural areas.36 On the other hand, families with preschoolers were significantly more likely than families with infants and toddlers to report “location” as their top reason for difficulty. This may be because preschool programs tend to be in central locations such as public schools, while home-based infant and toddler care is often available in local neighborhood settings. Finding a child care program appears to influence mothers’ ability to work, although there is no impact on fathers’ employment. Among families who sought child care so that a parent could work, mothers were significantly more likely to be employed if their family found a child care program. 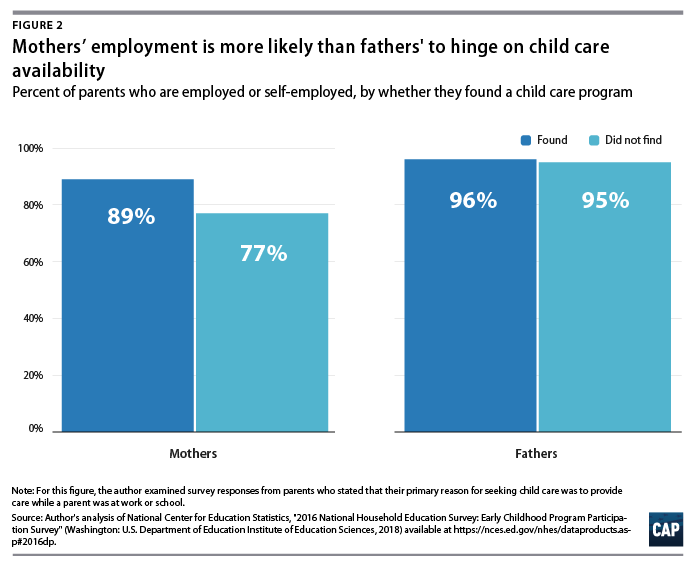 (see Figure 2) Eighty-nine percent of mothers who found a child care program were employed, compared with 77 percent of mothers who did not find a child care program.37 Whether or not a family found child care had virtually no effect on the likelihood that fathers were employed, as about 95 percent of fathers were working in either case. These findings should come as no surprise. Child-rearing responsibilities disproportionately fall on mothers, so problems with child care most frequently result in mothers making career sacrifices.39 While some families prefer for a stay-at-home parent to care for children, most families rely on two paychecks or the single parent’s paycheck to make ends meet. In the absence of viable child care options, mothers are often forced to modify their work schedules, settle for lower-quality care, or leave the workforce altogether—a decision that can jeopardize their family’s financial security. The most common changes mothers said they would make were looking for a higher-paying job, at 42 percent, and asking for more hours at work, at 31 percent. 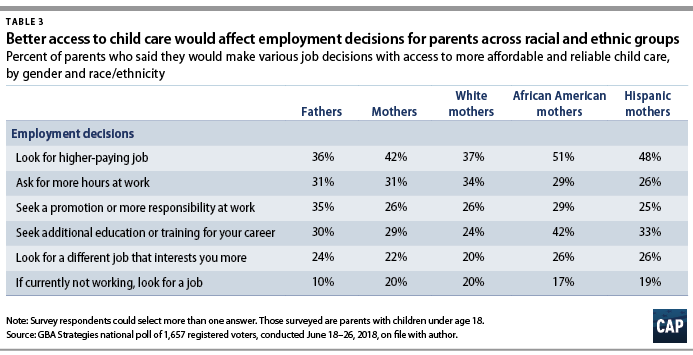 (see Table 3) This finding likely reflects the fact that many mothers are earning low wages. Nationally, 1 in 5 working mothers with a child age 3 or under work in a low-wage job, and women represent about two-thirds of the low-wage workforce.40 For these mothers in particular, child care costs consume much of their take-home pay. Additionally, child care availability often dictates when and where mothers can work, as many mothers decide to work during nonstandard hours or take on a less demanding job so they can care for their children.41 Alleviating the burden of paying for child care could free up mothers to pick up additional shifts, take on more hours at work, or seek a higher-paying job—decisions that would translate into critical income. Congress should enact the following policies to increase access to child care and support working mothers. The Child Care and Development Block Grant (CCDBG) is the largest source of federal funding for child care assistance. Although child care is a critical support for children and families, the CCDBG has been so underfunded that just 1 in 6 eligible families actually receive child care subsidies.54 In fiscal years 2018 and 2019, Congress included the largest-ever funding increase for the CCDBG, which will provide states with critical resources to expand access to child care assistance and improve child care quality.55 While this increase is an important first step toward supporting the nation’s chronically underfunded child care system, this funding must be sustained and further increased to achieve meaningful and lasting change. Half of Americans live in child care deserts, where there is an inadequate supply of licensed child care.60 Families living in rural areas, immigrant families, and Hispanic and American Indian or Alaska Native families disproportionately live in child care deserts; in these areas, fewer mothers participate in the labor force.61 Investments in the nation’s child care system must include targeted efforts to build the supply of licensed child care in these underserved child care deserts. Moreover, child care must be incorporated into any national infrastructure investment, as it is a necessary component of supporting workers and the economy. Enacting policies that increase access to child care is crucial to sustaining and strengthening the nation’s current and future workforce. Greater access to high-quality child care and early learning programs will support mothers so they can work and will benefit children, leaving them better prepared for kindergarten and to be productive citizens when they grow up. Child care must be central to any policy effort to promote gender equity, grow the nation’s workforce, and bolster the economy. Leila Schochet is the policy analyst for Early Childhood Policy at the Center for American Progress. The author would like to thank Heidi Schultheis, Diana Boesch, and the Early Childhood Policy team for their input and review of this report. This report presents findings from the author’s analysis of the 2016 Early Childhood Program Participation Survey (ECPP), as well as results from a national child care poll conducted by the Center for American Progress in summer 2018. The ECPP was administered as part of the 2016 National Household Education Surveys Program (NHES:2016) and collected data specifically about children who had not yet started kindergarten.68 The ECPP includes data from 5,837 households and is a nationally representative survey, representing 21.4 million children from birth to age 5. The survey asks parents to respond to questions about their child, their child’s participation in early childhood education programs, and characteristics of their child’s household and family members. Parents report on only one child for the survey, even if there are other children in their home. Later in this report, the author examines data from a survey conducted by CAP and GBA Strategies from June 18 to 26, 2018.69 The survey captured responses from 1,657 registered voters nationally and used an online panel and voter registration lists. 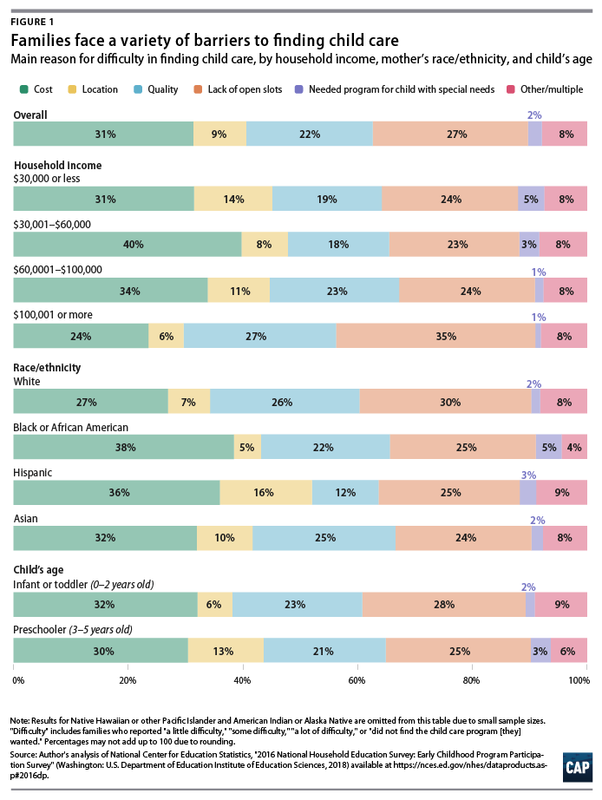 The survey also included a subsample of 484 parents whose children were under age 18, as well as oversamples of African American and Hispanic women to allow for more detailed comparative analysis. The survey was weighted to reflect available national demographic data on registered voters. Difficulty finding child care: The author analyzed responses from families that reported looking for child care in the past year—which accounted for about 60 percent of households in the ECPP survey. The author conducted descriptive analyses to report how much difficulty these families had finding child care, and examined various subgroups, for example, by household income, mother’s race and ethnicity, and child’s age. The author also examined the primary reason for difficulty finding child care among these subgroups; for this final portion of the analysis, the author did not report results for American Indian or Alaska Native mothers and for Native Hawaiian or other Pacific Islander mothers due to small sample size. Employment: The original ECPP data set provides child-level data. Before analyzing the impact of child care access on parental employment, the author reshaped the data set to access individual-level data for each parent. This made it possible to evaluate employment and other characteristics among mothers and fathers. For this analysis, the author decided to examine parental employment among families who reported looking for child care and who said that their primary reason for wanting a child care program was so that a parent could work or go to school. Although having access to child care enables many parents to work—including those who stated a different primary reason for seeking care—this assumption helped isolate the parents who explicitly stated that they were motivated to find child care so that they could work. The employment rate of parents in this analysis is higher than the national rate, perhaps because this was a subgroup of parents who were highly motivated to work. The author compared employment among parents who reported “not finding the child care program [they] wanted” with all other families who reported looking for child care. Here, the author assumed that families who reported other degrees of difficulty ultimately found a child care program and therefore included them in the comparison group of families who found child care. The author defined “employed” as parents who reported that they are “employed for pay or income,” “self-employed,” or a “full-time student”; she defined “unemployed” as parents who reported that they are “unemployed or out of work” or “stay at home parents.” The author excluded parents who reported that they were “retired” or “disabled or unable to work” for the purpose of this analysis.